If Blair can only have one friend who do Du want? Which Wears the best kleid during the coronation day? Would Du Like To Be gegeben The Role Of Princess Sophia Aka Blair? Why did not they are making BPCS 2? Made ​​a computer game in Princess charm school? Why do Du think Mattel didn't made an Isla doll? ‘A figure of Musik and beauty’. If Du notice deeply, you’ll figure out that Blair would not be becoming princess sophia without isla’s help. 1. Make a dress using PaintBrush. 3. And I shall chose the best dress and modify it for Blair. 4. I shall write a special Artikel for the winner. 5. The winner shall get famous! Don't Du want your Design for Blair? So come on, what are Du waiting for? 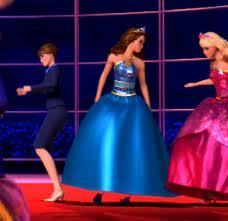 Queen Isabella is a deceased character in Barbie: Princess Charm School . But she never had an appearance except through portraits.She is the biological mother of Blair Willows. After attending the Princess Charm School and passing the semester, Isabella was crowned the princess of Gardania, and Gardania's magical crown glowed on her head, as she was the true heir. Her sister-in-law Dame Devin, who was a lottery winner, wanted to be Isabella's lady royal, but Isabella did not pick her. This led to Dame Devin holding a grudge against Isabella. Diana Kaarina as Blair Willows/Princess Sophia - the poor waitress of "Cafe Gardania" who wins a scholarship to Princess Charm School. She is kind, clever and clumsy, yet diligent. She loves her family and wants to support them. It is later revealed that she is Princess Sophia, the long Lost princess of Gardania. Morwenna Banks as Alexandra liguster, privet - the headmistress of Princess Charm School. I don't belong here at all. I could've walked away instead. On oben, nach oben of the world. Reaching up to touch the sky. "There's a princess in every girl." a comment was made to the poll: Do Du want attend to Princess Charm School! a comment was made to the poll: Who do Du like the most? a comment was made to the poll: Do Du Like Portia?? who was spin her tunes in this images?